Many thanks to all of you who are still hanging in there with me as I try to get back onto a regular posting schedule. The lack of internet connectivity is still causing a bit of a problem, but I’m hoping it will be taken care of soon. In the meantime, I need to ask for your help. My mother-in-law came up for a visit again this weekend. We had a great time yard sale-ing and thrift store treasure hunting on Saturday morning, and then new shoe shopping for me that afternoon. Catti-brie has decided, at one year-old, that shoe chewing is a great idea. I discovered and disposed of three pairs of ruined shoes when I was cleaning out my closet last week. The little stinker. At any rate, that evening, my mother-in-law went out to her car and retrieved a particularly good yard sale find that she had purchased a few weeks ago. 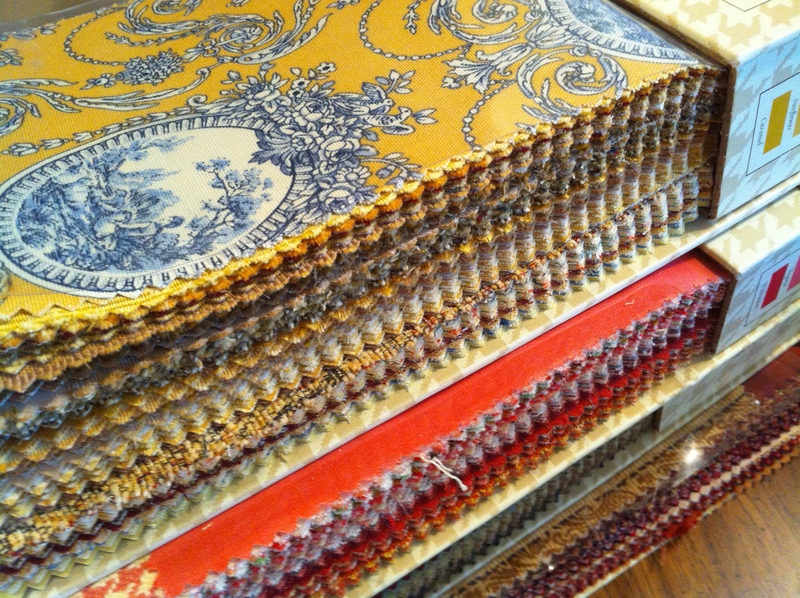 She walked in with a stack of fabric sample books. These books are filled with multi-purpose fabric samples in all types of blends and textures. I was so excited as I flipped through each book, studying the different patterns and color combinations. My husband pointed out that these fabric samples, which are all identically cut, would be easy to piece into a quilt of some sort. But, other than that, what can I do with all of these? I would love any project ideas that you may have for these little rectangles. They are all fastened together into a book, but the usable portion that is not stapled or altered measures approximately 8.25 x 5.75. 5 Responses to "Fabric Scrap Ideas"
How about little bags? I have a pattern for using placemats for bags and it is really simple. If you would like the gist of it, I’ll tell you how. If not bags, how about small throw pillows? Although I really like the quilt idea. Wow those are beautiful. I am a paper crafter, so I would use these on my cards. Cut them to fit a standard card, and use it as a background, or cut them into shapes, like birds, flowers, etc. wow – great fabrics! you could make some 14″ square pillow covers by blending some of the pieces together. What great ideas! I hadn’t though of a bag. I think I will definitely have to go with the throw pillows – maybe a thank-you for MIL? And what a creative use with the cards, Mary. As you know, I am addicted to pretty papers and cards, so your idea may just have to come to fruition too! bags? boxes? blankets? pencilcases? key fobs? I could so many ideas but u know….